In developed countries, vitamin deficiencies result mainly from poverty, food fads, drugs, or alcoholism. Vitamin toxicity (hypervitaminosis) usually results from taking mega doses of Vitamin A, D, B6, or niacin. In general, excess amounts of water-soluble vitamins are excreted via the Kidneys. Vitamins may be Fat soluble (vitamins A, D, E, and K) or Water soluble (B vitamins and vitamin C). 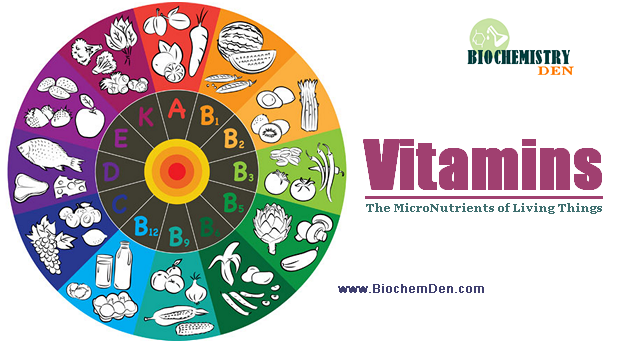 The B vitamins include biotin, Folate, niacin, pantothenic acid, riboflavin, thiamin, pyridoxine, and B12. After digestion and absorption, which circulatory system carries fat and fat-soluble vitamins? Vegans may develop vitamin B12 deficiency unless they consume yeast extracts or Asian-style fermented foods. Strictly vegetarian diets also tend to be low in calcium, iron, and zinc. 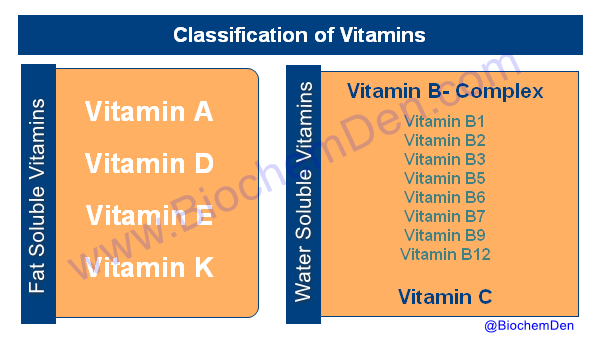 Vitamins can be divided into two major categories. Fat Soluble Vitamins: These vitamins are stored in the liver and fatty tissues until required. As such, they can be harmful if too much is taken in. Water Soluble Vitamins: These vitamins are not stored in the body. As such, they are required more frequently than fat-soluble vitamins. What is the basic difference between fat-soluble and water-soluble vitamins? 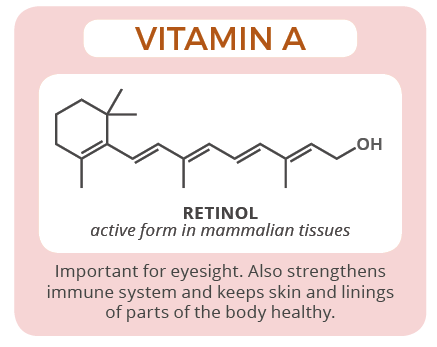 Vitamin A (retinol) is required for the formation of rhodopsin, a photoreceptor pigment in the retina. Vitamin A helps to maintain epithelial tissues. Usually, the liver stores 90% of the body’s Vitamin A. The body releases it into the circulation bound to pre-albumin (transthyretin) and retinol-binding protein. β-carotene and other provitamin carotenoids, contained in green leafy and yellow vegetables and deep- or bright-colored fruits, are converted to Vitamin A.
Carotenoids are absorbed better from vegetables when they are cooked or homogenized and served with some fats or oils. The Recommended Dietary Allowance (RDA) of Vitamin A is 900 micrograms for men, and 700 micrograms for women. Deficiency impairs immunity and causes skin rashes and common ocular effects such as dry eyes and night blindness. 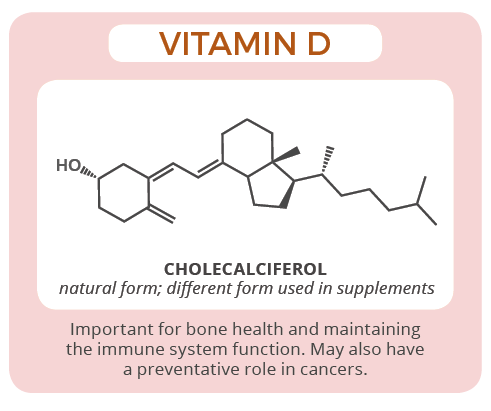 Vitamin D has two primary forms: D2 (Ergocalciferol) and D3 (Cholecalciferol). Vitamin D3 is synthesized in the skin by exposure to sunlight (ultraviolet radiation) and obtained in the diet chiefly in fish liver oils and egg yolks. In some developed countries, milk and other foods are fortified with vitamin D. Human breast milk is low in vitamin D, containing an average of only 10% of the amount in fortified cow’s milk. Vitamin D is a prohormone with several active metabolites that act as hormones. The liver metabolizes vitamin D3 to 25(OH)D, which is then converted by the kidneys to 1,25(OH)2D (1,25-dihydroxycholecalciferol, calcitriol, or active vitamin D hormone). 25(OH)D, the primary circulating form, has some metabolic activity, but 1,25(OH)2D is the most metabolically active. Inadequate exposure to sunlight may cause vitamin D deficiency. These recommendations were established by determining the level of Vitamin D that was enough to prevent bone demineralization or rickets. The safe, tolerable upper intake level of Vitamin D is 10,000 IU/day. Randomized trials using the currently recommended intakes of 400 IU of Vitamin D/day have shown no appreciable reduction in fracture risk. In contrast, experiments using 700-800 IU Vitamin D/day found less fracture incidence. Adults should be consuming at least 1000 IU per day of Vitamin D to maintain blood serum levels that are effective for strengthening the bones. 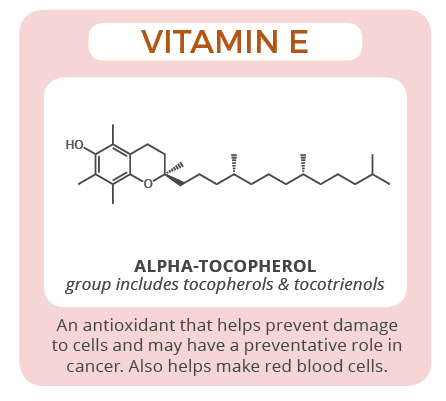 Vitamin E is a group of compounds (including tocopherols and tocotrienols) that have similar biologic activities. The most biologically active is α-tocopherol, but β-, γ-, and δ-tocopherols also have essential biologic activity. These compounds act as antioxidants, which prevent lipid peroxidation of polyunsaturated fatty acids in cellular membranes. Plasma tocopherol levels vary with the total plasma lipid levels. 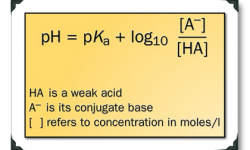 Normally, the plasma α-tocopherol level is 5 to 20 μg/mL. Dietary vitamin E deficiency is common in developing countries. Vitamin E deficiency causes degeneration of the axons of neurons (nerve cells) resulting in neurologic deficits, and fragility of red blood cells which is diagnosed with hemolytic anemia. Taking Vitamin E supplements is not recommended because studies have found an increased risk of heart failure and general mortality. Vitamin E is found in spinach, watercress, mustard greens, and many green leafy vegetables. Good sources of Vitamin E are oily plant seeds such as peanuts and sunflower kernels. 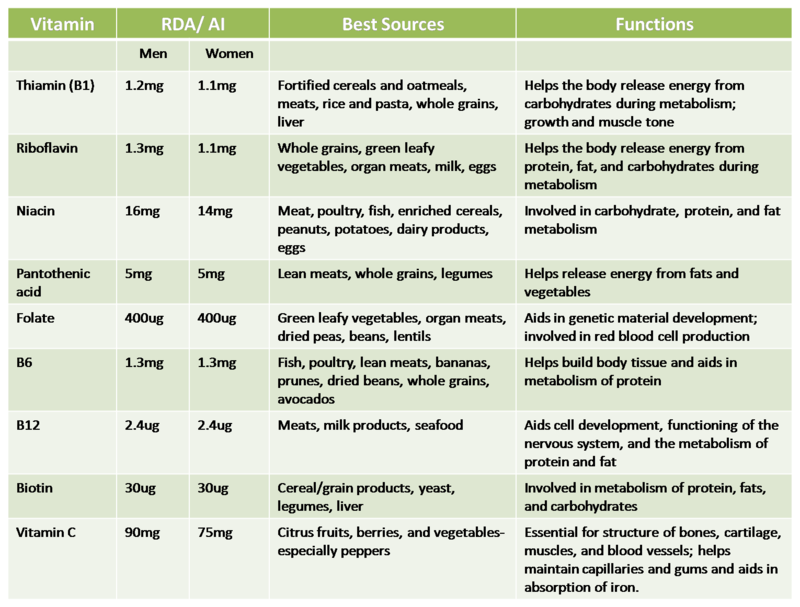 The Recommended Dietary Allowance (RDA) is 120 micrograms for men, and 90 micrograms for women. 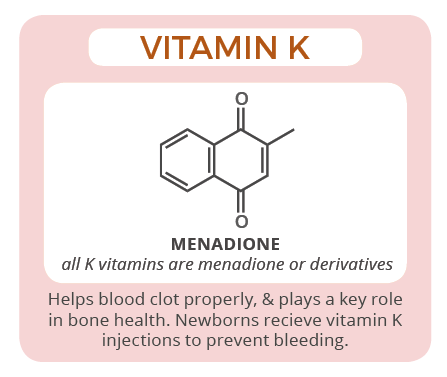 Vitamin K controls the formation of coagulation factors II (prothrombin), VII, IX, and X in the liver. In healthy adults, dietary vitamin K deficiency is uncommon because vitamin K is widely distributed in green vegetables such as kale, spinach, and mustard greens. The bacteria of the healthy gut also synthesize menaquinones. 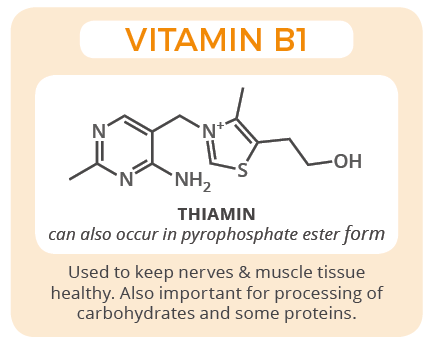 Thiamin or Thiamine (vitamin B1) is widely available in the diet. Thiamin is involved in carbohydrate, fat, amino acid, glucose, and alcohol metabolism. Thiamin is essentially nontoxic. 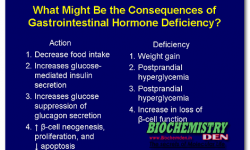 Thiamin deficiency (causing beriberi) is most common among people subsisting on highly refined rice or other carbohydrates in developing countries. Bean sprouts, brewer’s yeast, and fortified cereals are excellent sources of thiamin. 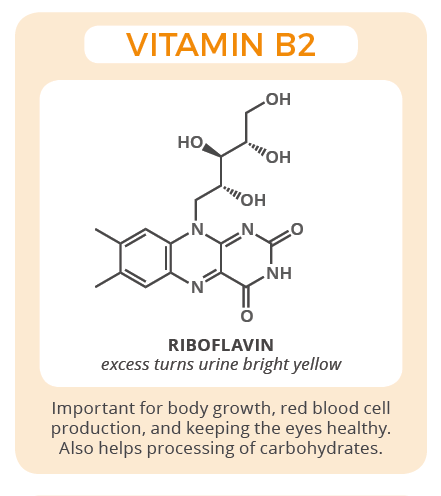 Riboflavin (Vitamin B2) is involved in carbohydrate metabolism as an essential coenzyme in many oxidation-reduction reactions. Riboflavin is essentially nontoxic. Riboflavin deficiency usually occurs with other B-vitamin deficiencies. Symptoms and signs include a sore throat, lesions of the lips and mucosa of the mouth, glossitis, conjunctivitis, seborrheic dermatitis, and normochromic-normocytic anemia. 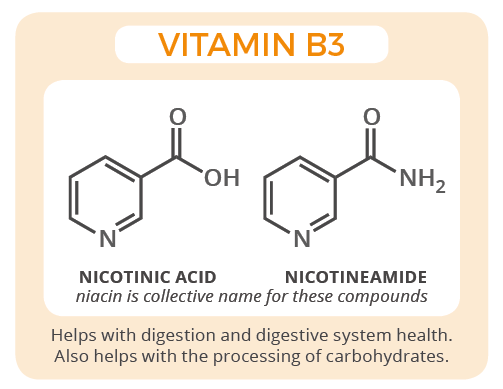 Niacin (Vitamin B3 or nicotinic acid) derivatives include nicotinamide adenine dinucleotide (NAD) and nicotinamide adenine dinucleotide phosphate (NADP), which are coenzymes in oxidation-reduction reactions vital in cell metabolism. Dietary niacin deficiency causes pellagra, a disease characterized by dermatitis, gastrointestinal disorders, and mental disturbances. Primary deficiency results from extremely inadequate intake of both niacin and the amino acid tryptophan, which usually occurs in areas where maize (Indian corn) constitutes a substantial part of the diet. Pantothenic acid (Vitamin B5) is widely distributed in foods, and high amounts are found in whole grain cereals, legumes, eggs, and meat. Pantothenic acid is needed to form coenzyme-A (CoA) and is critical in the metabolism and synthesis of carbohydrates, proteins, and fats. Adults require about 5 mg/day. Pantothenic acid is found in mushrooms, yeast, and liver. 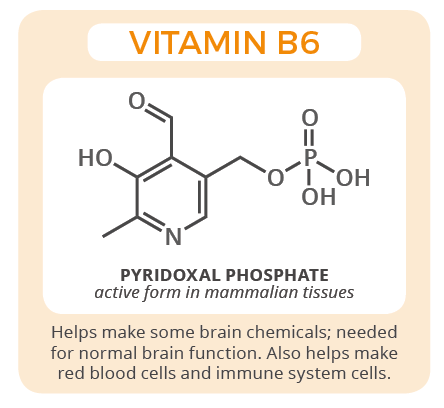 Vitamin B6 includes a group of closely related compounds: pyridoxine, pyridoxal, and pyridoxamine. 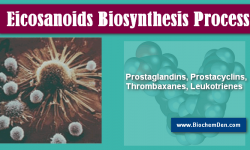 They are metabolized in the body to pyridoxal phosphate, which acts as a coenzyme in many essential reactions in blood, central nervous system, and skin metabolism. 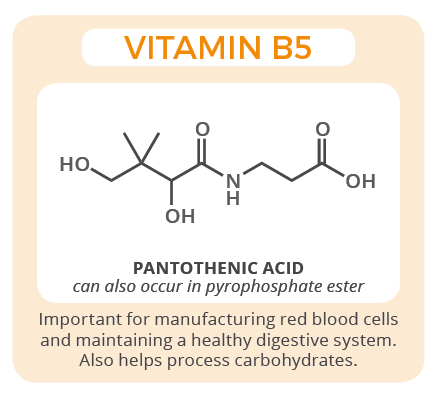 Vitamin B6 is essential in the biosynthesis of heme and nucleic acid, as well as in lipid, carbohydrate, and amino acid metabolism. Vitamin B6 is found in a variety of vegetables and meats. Many breakfast portions of cereal are fortified with Vitamin B6. Some natural sources of Vitamin B6 are brewer’s yeast, Chinese cabbage (Pak-Choi), and red and green peppers. 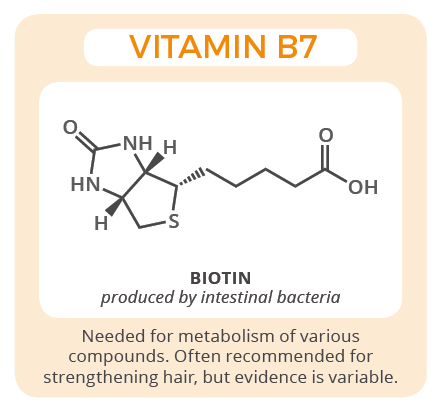 Biotin (Vitamin B7) acts as a coenzyme for carboxylation reactions essential to fat and carbohydrate metabolism. Adequate intake for adults is 30 μg/day. Liver, egg yolks, green vegetables, and whole grains are rich sources of biotin. Folate, also called Vitamin B9, is involved in maturation of red blood cells and the synthesis of purines and pyrimidines which folic are required for the development of the fetal nervous system. Adequate folic acid intake before conception and throughout the first trimester of pregnancy helps prevent specific brain and spinal cord defects such as spina bifida. Folate is absorbed in the duodenum and upper jejunum. The US recommended the daily dose of folate is 400 μg and the upper limit is 1000 μg. Folate is essentially nontoxic. Deficiency produces megaloblastic anemia indistinguishable from that due to vitamin B12 deficiency. A lack of folate in old age significantly increases the risk of developing dementia. Folic acid is found in dried peas, dried beans, yeast, and leafy green vegetables such as spinach, endive, lettuce, and mustard greens. 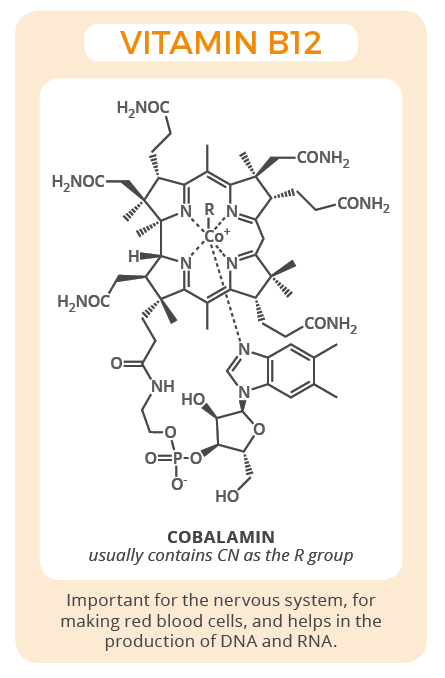 Cobalamin is a general term for compounds with biologic vitamin B12 activity. 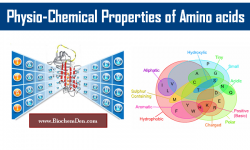 These compounds are involved in nucleic acid metabolism, methyl transfer, and myelin synthesis and repair. They are necessary for the formation of healthy red blood cells. Vitamin B12 is released in the stomach’s acid environment and is bound to R protein. Pancreatic enzymes cleave the B12-R protein complex in the small intestine. After cleavage, intrinsic factor, secreted by parietal cells in the gastric mucosa, binds to vitamin B12. Intrinsic factor is required for absorption of vitamin B12, which takes place in the terminal ileum. The Recommended Dietary Allowance (RDA) is 2.4 micrograms, which is the amount found in 3 ounces (85 grams) of meat. Vitamin B12 is found in clams, oysters, turkey, chicken, beef, and pork. Dietary vitamin B12 deficiency usually results from inadequate absorption, but deficiency can develop in vegans who do not take vitamin supplements. Deficiency causes megaloblastic anemia, damage to the white matter of the spinal cord and brain, and peripheral neuropathy which is characterized by tingling or numbness in the hands or feet. 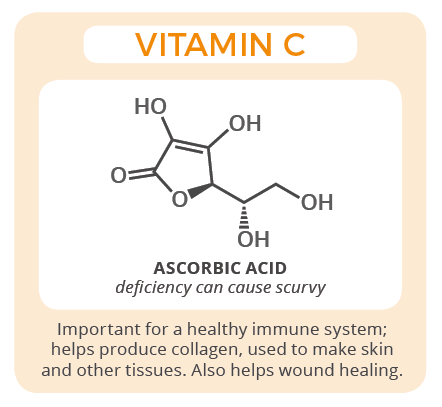 Vitamin C (ascorbic acid) plays a role in collagen, carnitine, hormone, and amino acid formation. It is essential for wound healing and facilitates recovery from burns. Vitamin C is also an antioxidant, supports immune function, and facilitates the absorption of iron. In developed countries, deficiency can occur with general under-nutrition, but severe deficiency (causing scurvy) is uncommon. Symptoms of deficiency include fatigue, depression, and connective tissue defects such as gingivitis, rash, internal bleeding, or impaired wound healing. The Recommended Dietary Allowance (RDA) is 75 milligrams for women, 90 milligrams for men. The tolerable upper intake level of Vitamin C is approximately 2 grams (2000 mg) per day. Higher amounts can cause stomach upset and diarrhea. Vitamin C is found in fresh fruits and vegetables. Citrus fruits like oranges and lemons are good sources of vitamin C.
Vitamins can be grouped into two categories, fat-soluble and water-soluble. Fat-soluble vitamins are dependent upon fats for absorption into the bloodstream. They are stored in fat cells found in the liver, kidneys, and wherever another fat tissue is found. Because they can be stored, it is not essential that fat-soluble vitamins be ingested daily. In fact, taking more fat-soluble vitamins that are needed by the body can be harmful. This usually occurs when someone is taking vitamin supplements. To avoid taking toxic levels of fat-soluble vitamins, do not exceed the Recommended Dietary Allowances (RDA) which are listed on vitamin bottles. The RDA for nutrients is published by the Food and Nutrition Board of the National Research Council. Fat-soluble vitamins include Vitamins A, D, E, and K.Water-soluble vitamins include Vitamins C, B12, and B complex vitamins. With the exception of B12, the body stores water-soluble vitamins for a very short period of time. The body rids itself of excess amounts through urination, so water-soluble vitamins must be ingested daily, according to the suggested RDA. To which of the following families do folic acid and panthothenic acid belong? Which one of the following is a fat soluble vitamin and its related deficiency disease?